This study examins the intra- and inter-individual changes in the foraging route-choice behaviour of 45 female Antarctic fur seals Arctocephalus gazella breeding at the Cap Noir colony in the Kerguelen Archipelago, southern Indian Ocean. Satellite transmitters were used to track seals during one or more consecutive foraging trips in 3 consecutive austral summers (1998 to 2000). In all years of study the seals showed a Œcolony-preferred direction¹, concentrating their trips at sea in a 140° arc east of Kerguelen, indicating a preferred area for foraging. Within this area, lactating females travelled in 1 of 2 main directions: north east toward the edge of the Kerguelen plateau; and less commonly, east/south east. Each direction led seals to sub-areas characterised by different bathymetric features where animals appeared to use different tactics to search for food patches. Moreover, a fidelity index incorporating the mean direction of successive trips and the colony preferred direction indicated the existence of an individual directional fidelity. 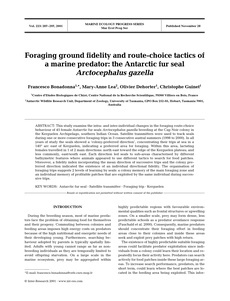 The organisation of foraging trips suggests 2 levels of learning by seals: a colony memory of the main foraging zone and an individual memory of profitable patches that are exploited by the same individual during successive trips.